Hi friends...happy Monday! This weekend flew by, didn't it!? Things have been super busy around here between planning for baby DeWire's arrival, Todd's crazy work schedule and just life in general. We are officially in due date month which is so hard to believe! 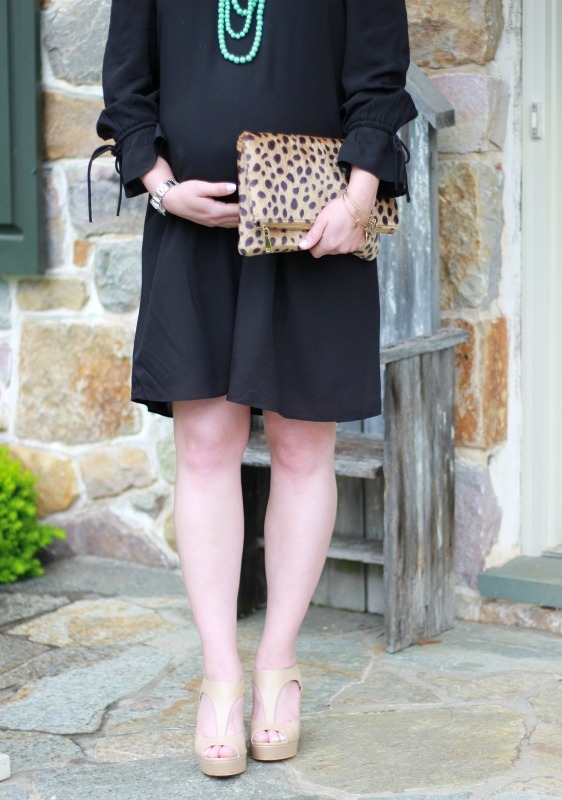 It's been awhile since I've done a bumpdate post, so today I'm sharing a 36 week bumpdate and this fun summer outfit. Okay...fashion first. This tie cuff off the shoulder dress is just too adorable! With my growing bump, I'm running out of clothing options and cute content to share with you all. I went to LOFT last week and found this black dress (also comes in red) that works for every girl, pregnant or not! I'm seeing tie sleeves everywhere lately and I love the trend. It definitely takes this dress up a few notches! 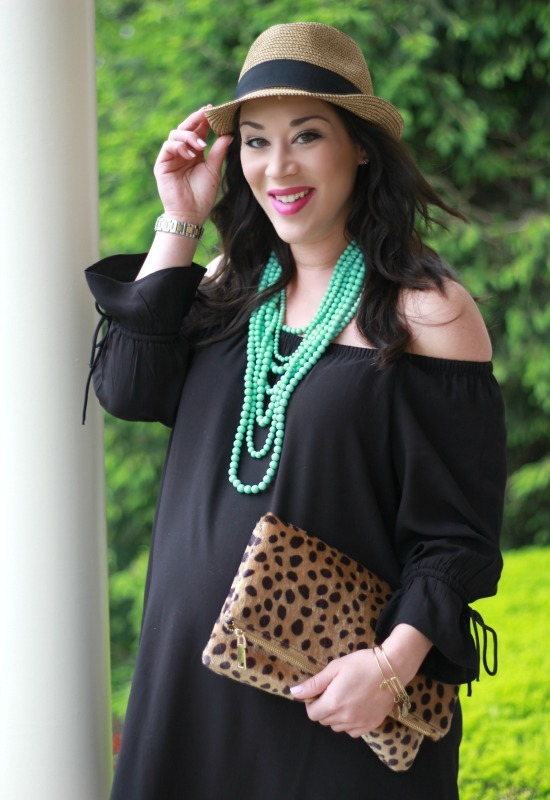 For spring and summer, I like to add a pop of color to black (especially mint and coral shades). 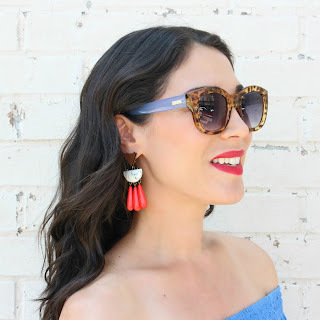 I wore my bold beaded strands (on sale for $26) from Baublebar and this necklace seriously makes a statement!! I kept the rest of my accessories neutral (shoes, clutch, hat) so nothing competed with the dress and beads. By the way, if you're looking for a cute fedora, I recommend this one from Nordstrom...only $18 and goes with everything! How I'm Feeling: Well, all of a sudden I'm definitely feeling being in the last month! LOL. I feel okay for the most part but I have developed neck and shoulder muscle knots and tension which have been causing stiffness, pain and headaches. No fun. I've been told it's from carrying the extra weight, posture and sleeping positions. Any other momma's out there have this!? Other than that, my feet are a good size bigger now so my shoe choices are limited (don't be impressed by my blog photos, I'm just squeezing my feet into heels and then they come right off! #honest). I've been told many times that the last month is the toughest and to hang in there! These things are unwanted, but I know it could be way worse and I'm blessed to not be dealing with some of the things I've seen other's face during pregnancy. What I've Learned Lately: Mentally, I feel good most days and have a huge list of things to accomplish. Physically, I just can't get it all done! I'm going strong during the day and then by the evening I'm ready to collapse (so basically, Todd sees me at my worst each day LOL). I'm learning I have to slow down a bit now and not overbook myself (I had to cancel 2 brunch dates with friends this week!). Cravings: Nothing crazy or strange. I'm definitely not one of those pregnant girls who crave odd combinations like pickles and ice cream! I mostly crave the same foods I would usually eat. Movement: He has been moving a lot lately but the movement is different. I can tell he is getting big! The movement is less kicks and more of feeling certain body parts surfacing at spots of my belly. I know he is in one set position now because I feel movement at the same spots (lower left of belly button and under right ribs). It's a weird feeling but really cool! Name: We are making progress but have not officially decided on a name! It's actually really tough. I had hoped to know for sure before he was born, but I think a final decision will be made after we see him. How Jax has been: Jax definitely knows something is up! He keeps seeing all this baby stuff come into the house and knows something is going on in the nursery room. He thinks that every toy, stuffed animal and rattle is for him (this has been a challenge)! I mean, who can blame him? All the squeaky and cuddly toys he's ever seen have been for him! Ha. They say dogs can sense you are pregnant but I'm not sure he knows. He is super smart but he's a terrier so he thinks the world revolves around him! Things We've Purchased: This post is coming soon! I have lots of baby products to share with you all (hopefully some of you find this interesting!). Thanks so much for reading...have a great day! I ADORE this dress on you!! And the fact that you are rocking a non-maternity dress at 36 weeks says you are KILLING the pregnant body (YOU GO!!) and that that dress is just that awesome. I love the OTS detail, totally on trend and that necklace is the perfect pop of Spring! Thanks so much Tiffani! You are THE SWEETEST! This outfit is adorable from head to toe...and baby bump as well!! ;) The clutch and those colored beads are fabulous. Nicely done! 36 weeks is oh so close!! Homestretch, girl!! Looking gorgeous, but I totally remember feeling all that too. I was exhausted at the end of each day and just wanted to sleep. I'm so glad it is going well for you. 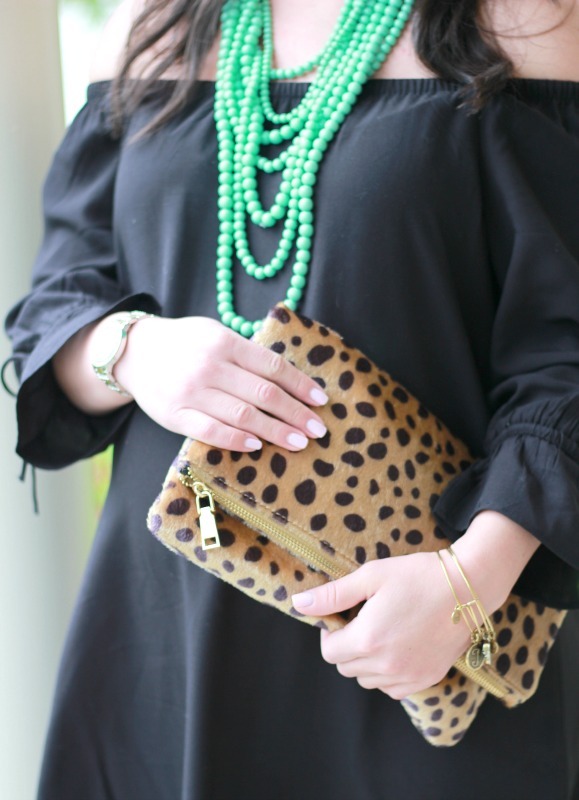 Love that color combination of mint and black with a dash of leopard!